Love it or hate it, it's San Francisco Fleet Week again. Have questions? We've got you covered. Every October since 1981, military ships fill San Francisco Bay and the Blue Angels usually take to the skies. Fleet Week is a celebration of the Bay Area's naval history and is made up of a series of events taking place all around San Francisco, from art exhibits to ship tours and air shows. The U.S. Navy, U.S. Coast Guard, U.S. Marine Corps and the California National Guard are all partners for this event. “Fleet Week is a time when we celebrate our city’s rich naval history and maritime traditions and pay tribute to the men and women of our Armed Forces for their service to the defense of our country,” San Francisco Mayor London Breed said in a press release. It's known to draw millions of visitors and, according to the press release from Breed, Fleet Week brings over $100 million to San Francisco's economy. This year it takes place Oct. 1 through Oct. 8. This year's festivities kicked off with emergency preparedness and response exercises. The Parade of Ships takes place at 11 a.m. on Friday, Oct. 5. It's what it sounds like: an event in which U.S. Navy ships parade on the bay and go under the Golden Gate Bridge. 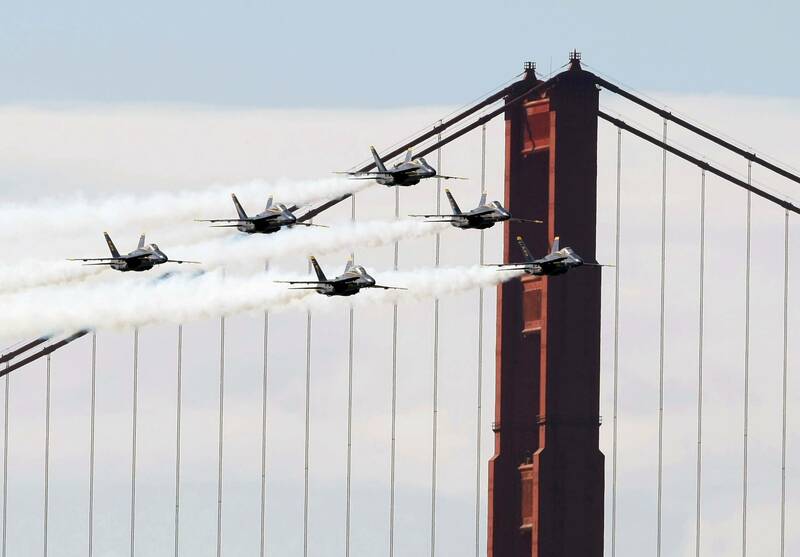 Marina Green is a prime spot to watch the parade, and if you stick around, the San Francisco Fleet Week Air Show follows it from 12 p.m. to 4 p.m. The air show takes place over three days, so if you miss Friday's show, you can catch it Saturday and Sunday. All you have to do is head over to the festival at Marina Green (it's free! ), but if you're looking for a better view and don't want to bring your own chair, they do offer tickets for prime spots. Check out the full calendar of events (with a map!) here. San Franciscans are split on whether they love or hate this high-flying show featuring aerial acrobatics by the U.S. Navy's Blue Angels. Still, their three-day air show is one of the more popular Fleet Week events. Some complain about the noise, cost and pollution, but it does bring in an estimated 1 million people. Camera, backup battery, binoculars (depending on how far you are from the air show) and a map. You might also find the Fleet Week mobile app useful. Depending on which event you're attending, and its location in the city, parking may be a challenge. The Fleet Week website is offering a quick and easy way to reserve parking at various lots for a slight discount. If you're planning to attend events over the weekend, do keep in mind Hardly Strictly Bluegrass will also be taking place, so parking may be harder to find. If you're getting around the city via public transit, use 511 to help plan your trip. With many events happening this weekend and the closure of the Salesforce Transit Center, it might also be helpful to check for advisories before heading out. The San Francisco Bay Ferry is expanding service this weekend on Saturday, Oct. 6 and Sunday, Oct. 7. There will be 11 round trips each day from Vallejo to San Francisco and 23 trips from Alameda/Oakland to San Francisco.